During the cold winter months I love fixing soup for my family. It’s a comfort food that warms the soul and makes you feel good. My days can sometimes be hectic so anytime I get the chance to use my crockpot I jump at the chance. This Slow Cooker Butternut Squash Soup Recipe is so delicious and a great way to get your family to eat vegetables since it doesn’t really have a veggie taste as my kids would say. Since we are looking to eat healthier, we try to change up the ingredients we use when we can. 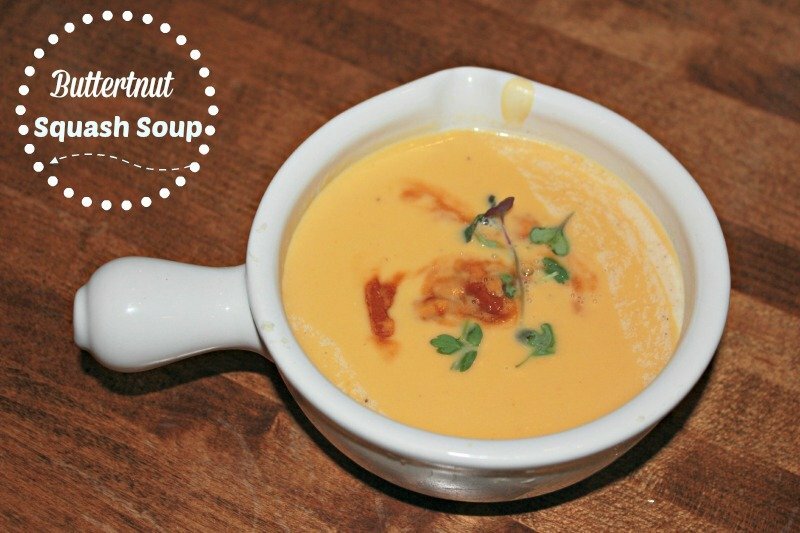 If you are doing the Paleo Diet then you are going to love this Slow Cooker Butternut Squash Soup Recipe. I hope you enjoy it. Tip: look for pre-cut butternut squash at your local grocery store to make this recipe even easier to make. Place apples, squash,garlic, carrots, onion, stock and seasonings in a crockpot on low and cook for 6-8 hours. Stir in almond milk and mix well. Pour the soup/milk mix into a blender and blend until smooth (you may need to do this in two batches). If you want a thinner consistency then add additional stock. Add more pepper and sea salt to taste. Top it with chopped bacon and dried parsley if desired. Thursday Night Soup! Love it. Can’t wait to try some of these too. I am a huge soupaholic.